Mind over Fatter - your secrets to weight loss plan. 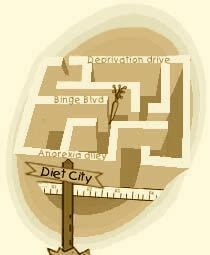 The Mind over Fatter journey takes you all the way from 'Diet City' (the mental prison of food and body worries -where you are constantly asking: 'Am I overweight?') back to Nature's Valley (where you live, love, laugh and let your body find it's natural weight). It helps you find self-love so you can stop hating your body, it teaches you intuitive eating and it shares information with you on how to have health at every size (HAES). ♥	My story of going from self-hatred and yo-yo dieting to self-love and NEVER DIETING (chapter 2).I’ve literally lost hundreds of kilograms in my lifetime and regained them all. I once gained 267% of my body weight!!! ♥	how your food and eating issues came about (pg 25 and 26) and how to reverse them and prevent your children developing them. ♥	About the mind-blowing inner wisdom you were born with when it comes to eating (chapter 6). THIS is why you won't ever need diet products ever again! ♥ Why you aren’t to blame for finding exercise to be a chore and a bore (pg 54-55) Bye bye guilt! Yay! To download this free sample chapter from the Mind over Fatter Progran about my journey to stop dieting right click on the 'Download your free sample here' and from the menu select 'save as. This download require Adobe reader. ♥	Why diets CAUSE food obsessions and food addictions (pg 1) AND MAKE YOU FATTER This will free you from thinking you ever have to diet again. Yay! ♥	How diets mess up your metabolism (pg 4) Factual proof and the science proving that they do! ♥	Why willpower is TOTALLY MEANINGLESS (pg 27) except when you have too much of it and then it trips you up! Even if you've tried every diet in this history of mankind - you can still succeed with Mind over Fatter. It's true - in my 30 years of frantic dieting I tried every diet imaginable and they all failed me! Ditching dieting turned out to eventually be what saved me. ♥	POWERFUL VISUALISATIONS to uncover what’s eating you (pg 2). Remember this: so long as something is 'eating you' - you'll keep on eating. If you're an emotional eater - in other words you eat when you're feeling bad, mad, glad or sad, you will love Mind over Fatter. ♥	How YOU’VE BEEN CONNED by the body-beauty bunch into losing your self-confidence (pg 5-7) AND how to escape and get it back. Don't put your life on hold on minutes longer. The time to live and love more is NOW! According to FitPregnancy Magazine (SA): "The beauty of this program is that it's one you will go back to again and again. It is packed with information, ideas, snippets and wisdom that should have even the most dedicated food-obsessor wanting to break free from the tyranny of diet. " ♥	Exactly how to create your own internal appetite suppressants by recovering BODY-WISE and INTUITIVE EATING HABITS (pg 1) Mind over Fatter is just going to help you re-discover them! ♥	How to strike the words ‘illegal food’ from your vocabulary. VIRTUALLY NO ONE KNOWS how powerfully these wrods impact negatively on their eating (pg 16). All food is legal!!! ♥	Get our fabulous Mind over Fatter TASTE TEST. Just this tip alone is enough to change your eating forever (pg 20). You'll be given all the tools to create your very own appetite suppressants - You'll NEVER have to buy any ever again and they won't put toxins into your body! "Many of us either never allow ourselves to get hungry or we’re on some diet. Well, it’s time to trust your body and its needs again. 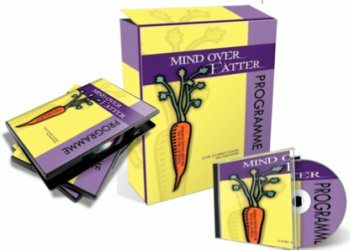 Mind Over Fatter provides realistic, back-to-basics tools by encouraging a truce between mind and body. It’s a refreshingly sensible antidote to all the quick-fix prescriptive and restrictive diets out there. Consider it your personal, interactive textbook to healthy, permanent weight loss and self-love that’s inspiring, motivating, and fun to read." ♥	THE most POTENT ways to create your very own FAT-BURNERS (pg 2) and all without a single pill ever passing your lips! ♥	The quick and easy test to know how efficient your body is (pg 7) It’s so simple yet SO FEW people know how to do this! 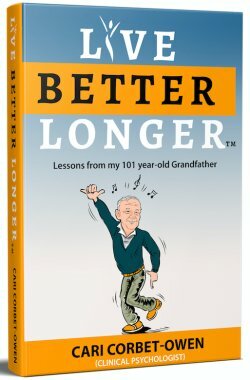 "If you've tried the diets, bought the pills, read the books and still your weight yo-yos - then Mind over Fatter is the non-diet plan for you. Say 'goodbye' to fatness and 'hello' to mental fitness." Ellen Hodgson Brown: author of 11 published books including 'Nature's Pharmacy'. The Mind over Fatter program is currently not open for new participants - please let me know that you would like to be put on the waiting list for when we open it up again. Feel free to let me know if you're interested in any other products as well.